If you’re in the market for an upscale, centrally located place to lay your head at night, the Renaissance Charleston Historic District Hotel is a smart choice. 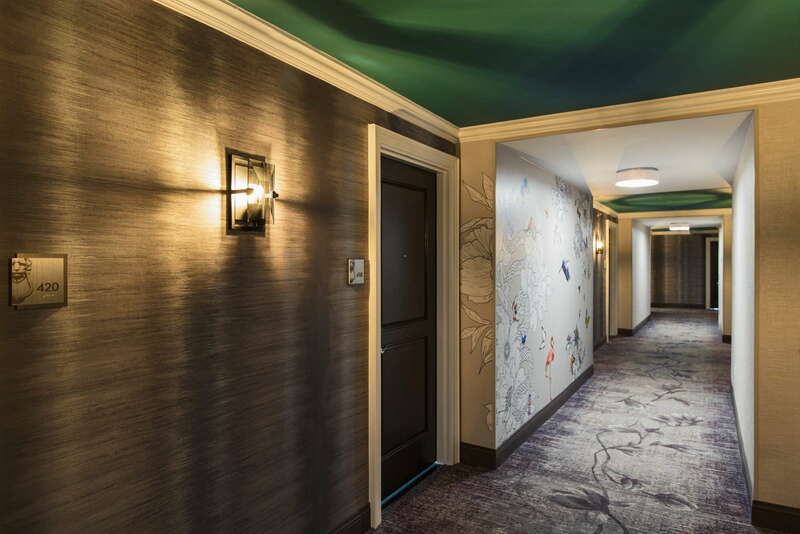 A Marriott property, you’ll get the comfy beds and dependable service you’d expect from the chain, while added perks include a rooftop pool, quaint courtyard, and contemporary décor. 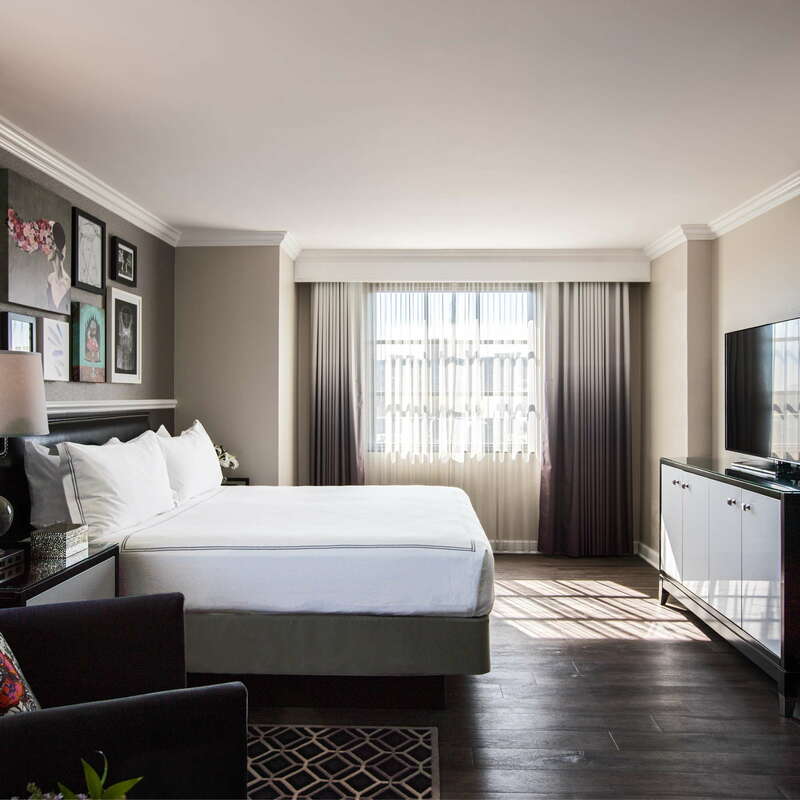 Grounded in a soothing gray color palette (and haint blue ceilings as a nod to local tradition), guest rooms hold modern furnishings, funky art, and heavy floor-to-ceiling drapes. Layouts range from a standard king or double-double to a two-room suite with a separate lounge area. 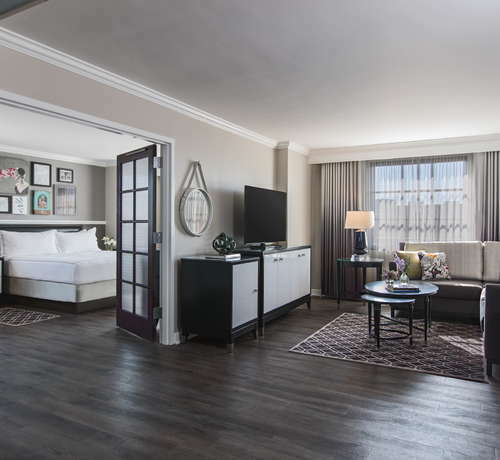 Terrace rooms boast French doors leading to a petite private balcony. YOU SHOULD KNOW This block of Wentworth Street is conveniently located, for sure, but doesn’t offer the best views (think a parking garage and power lines), so a balcony room may not be worth the splurge. 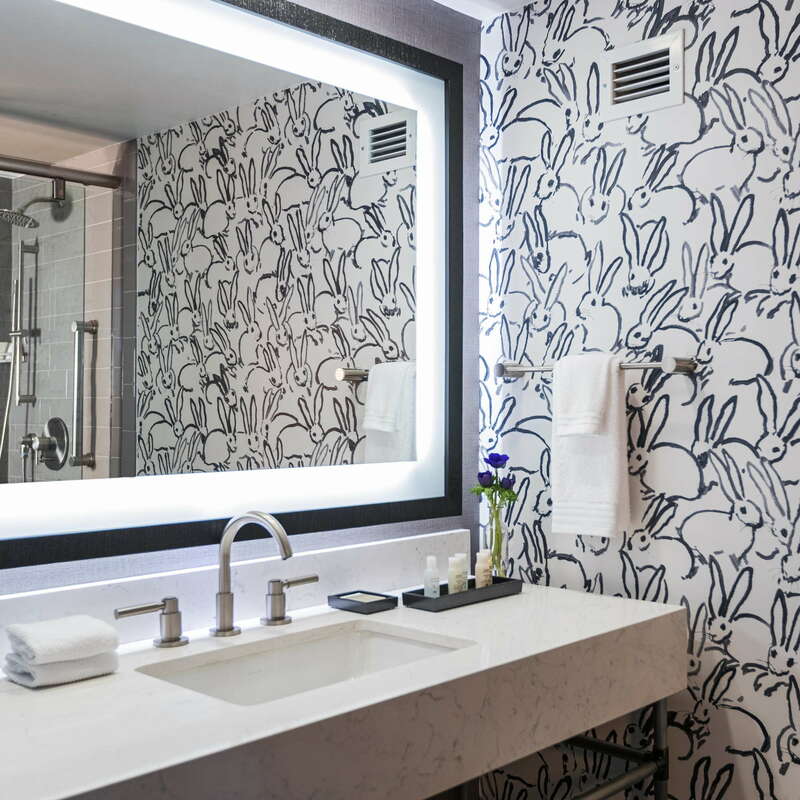 The marble vanity and tiled shower-tub combo are spacious and feel fresh. The star of the show though? 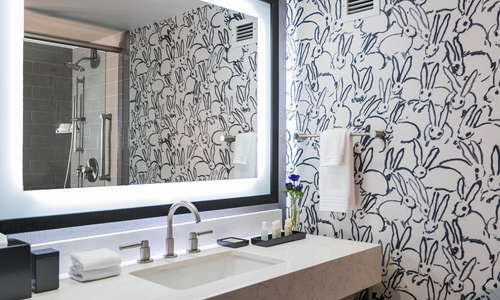 The room’s quirky black-and-white rabbit wallpaper. A wide, welcoming space, the bustling lobby’s filled with midcentury-inspired pieces, intriguing wall art, and an eclectic selection of comfortable seats and sofas. Take a load off in the library—a dimly lit nook of the lobby with a fireplace and bevy of books for your browsing pleasure. It’s an especially sweet place to sip a pre-supper spirit. The open-air rooftop pool deck is tight, but has comfy wicker lounges and a fair-sized pool perfect for a post-sightseeing dip. Pack your workout gear: there’s a fitness center that overlooks the pool with cardio machines and free weights aplenty. The onsite restaurant, 1KEPT Kitchen & Bar, won’t disappoint for breakfast, lunch, or dinner. It partners with local farms and growers to cook up satisfying snacks and entrees like truffle popcorn, a pimiento cheese board, duck confit, and house-made pasta. Libations are surprisingly tasty for a chain hotel’s bar. Sip yours on 1KEPT’s charming outdoor patio. Have your car valeted or park it and leave it at the garage across the street. You’re within an easy walk of the bustling food-and-bev scene of upper King Street as well as the historic district—for a quicker transport, hop aboard a pedi-cab or hail a ride-share. Start the day off right with a coffee and sweet treat from Christophe Artisan Chocolatier-Patissier (3-minute walk). Head to Hominy Grill (8-minute drive) for an unbeatable Southern brunch—but do be prepared to wait … a while. For dinner, head north on King Street to The Darling Oyster Bar (16-minute walk) or the delectable Italian eatery Indaco (17-minute walk). Savor sips of an adventurous cocktail at Félix (19-minute walk), a Parisian-inspired watering hole on upper King Street. For a club scene that’ll last late into the night, try Trio Club (8-minute walk) or its neighbor, Mynt (8-minute walk). 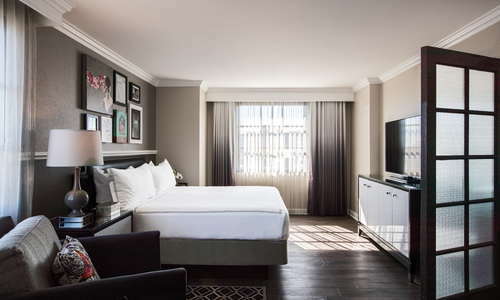 Mere steps from the best shopping corridor in town—and within walking distance to most historic sights and buzzed-about restaurants, too—this Marriott property offers modern rooms without the price tag of a boutique inn and is perfect for travelers planning to be out and about often during their stay. The rooftop pool and onsite restaurant and bar supply the creature comforts needed after a day spent exploring the city.